The moistest, most delicious cake you’ll ever find. And this Chocolate Obsession Cake is also the easiest, which might be the best part! I’ve been making this delicious chocolate cake for almost as long as I can remember. I’d love to tell you that Chocolate Obsession Cake is its original name, but I would be telling a lie, a BIG lie. I actually made the name up a number of years ago when I was teaching a cooking class revolving around preparing an elegant Valentine Dinner. 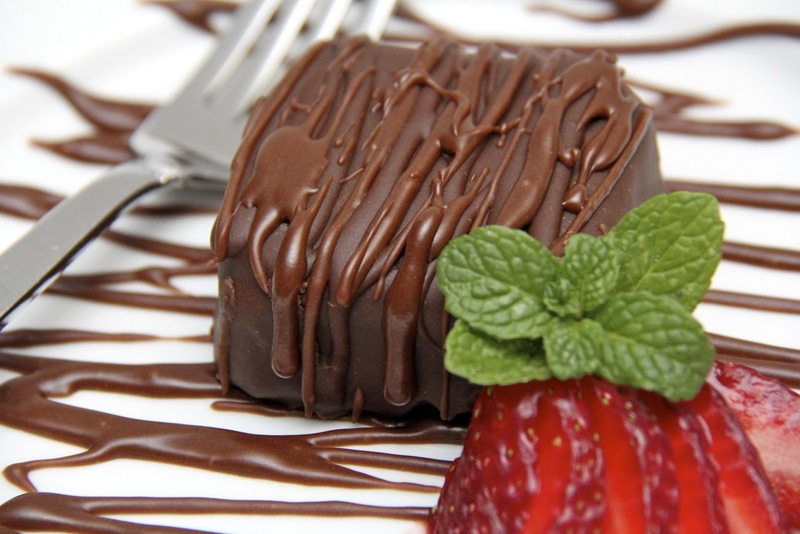 I mean really, does Texas Sheet Cake (the real name) sound like a fancy-dancy sophisticated Valentine dessert? It doesn’t in my book but it is a fabulous cake; rich and decadent, dense yet light and delicious enough to qualify as a gourmet indulgence – so I just gave it a festive new moniker and a bit of a face-lift! Tada! 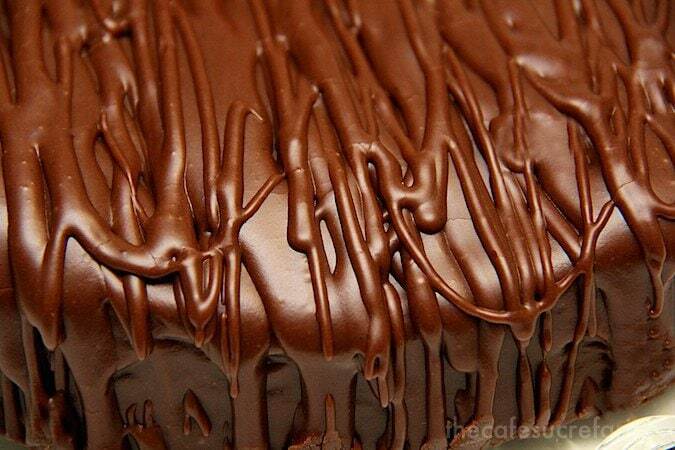 Chocolate Obsession Cake! As it’s true name suggests, this Chocolate Obsession Cake can be made in a flash with a large (Texas-style) cookie sheet pan. When our kids were growing up, often we would start watching a movie as I was throwing this cake together. Forty-five minutes later, about the time we were ready for a short intermission, the cake would be baked, frosted and doled out on plates, warm and ready to be enjoyed with an ice cold glass of milk. I often still prepare this cake in a sheet pan, but when a more impressive dessert is called for, I make it in round or square muffin pans (pictured above) or round cake pans (pictured below) and frost it with a pour-over style frosting. 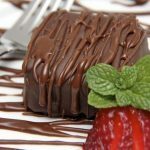 Whether you decide to call this yummy dessert Texas Sheet Cake or gussy it up a bit for a special occasion, like New Year’s Eve, Valentine’s Day or a loved one’s birthday and call it Chocolate Obsession Cake, I have a feeling that once you try it, it will become a favorite at your house also! The moistest most delicious cake you'll ever find. It's also the easiest, which is the best part! 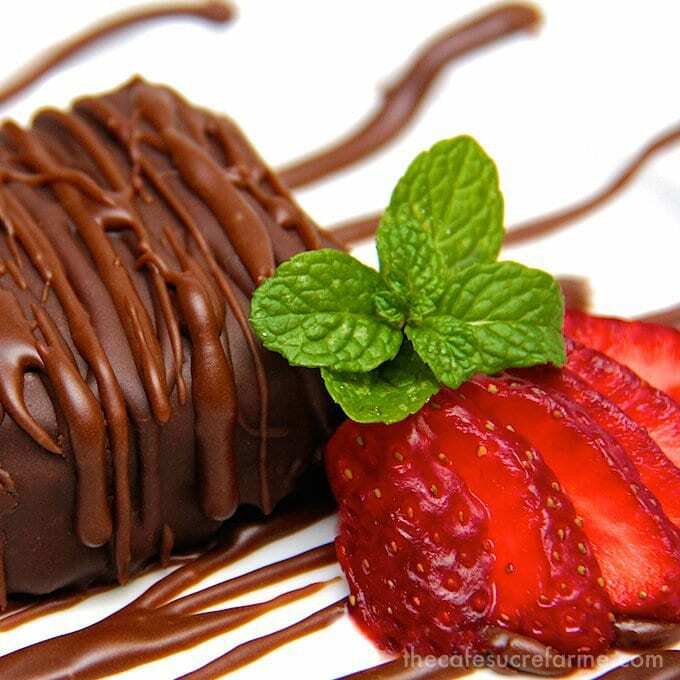 Place butter, water, and cocoa in microwave safe dish. Microwave 3 minutes, stirring once about halfway through. Add sugar and flour and whisk until smooth. Add eggs and buttermilk, salt and soda and mix well. Stir in vanilla. Prepare pan (or pans) by spraying generously with baking spray. Pour batter into pan or pans. (For muffin pans, I used about 1/4 cup batter per cake.) Bake 25-30 minutes for 11" x15" pan or 15-25 minutes for cake pans or muffin pans. When the cake is done, it will bounce back when lightly touched. Another way to tell if it is done is to insert a toothpick into the middle of the cake and pull it out. If the cake is done, the toothpick will come out clean or with a few crumbs, not coated with batter. Remove from oven and frost as directed below. For the frosting, place butter and baking chocolate in microwaveable bowl. Microwave on high for 1 1/2 minutes or until chocolate is melted. Stir until blended with a wire whisk. Add milk and vanilla. Mix well. Slowly add powdered sugar and whisk until smooth. Frosting should be thick but still pourable when warm. If too thin add a bit more powdered sugar. If too thick add a little extra milk. I used square muffin pans for my cakes in the pictures above. For sheet pan-type cake use a 11" x15" pan. For round cakes use two 9" cake pans. For individual cakes use two (12 cup) muffin pans. 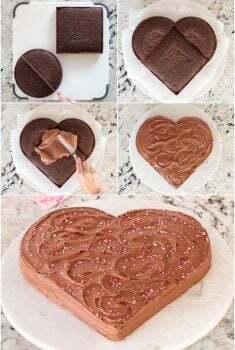 For sheet cake - Allow cake to cool for 10 minutes, then pour warm frosting over cake in pan and spread with an off-set knife to distribute evenly. If you can stand to wait :), allow to cool before cutting into squares and serving. For round cakes - Allow cakes to cool for 10 minutes, then invert onto cooling rack and allow to cool for another 30 minutes. Set cooling rack with cakes on top of a large piece of foil. 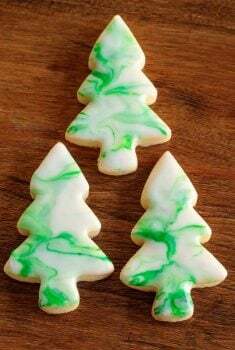 Pour about one quarter of the frosting out onto each cake and spread with an off set knife to spread frosting across top and over edges of cake. Add a bit more frosting if needed to completely cover top and sides of cake. Excess frosting will drip through wire rack onto foil (Try to do this when your husband, children or best friend isn't around!) Allow frosted cake to sit for 10 minutes, then decoratively drizzle more frosting back and forth across top of cake. 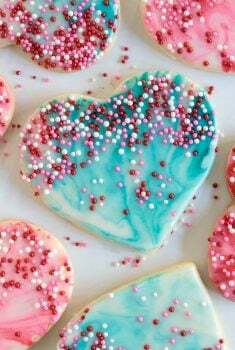 Repeat as desired until frosting is used up or desired thickness of frosting is achieved. If necessary, scrape excess frosting off of foil into bowl. 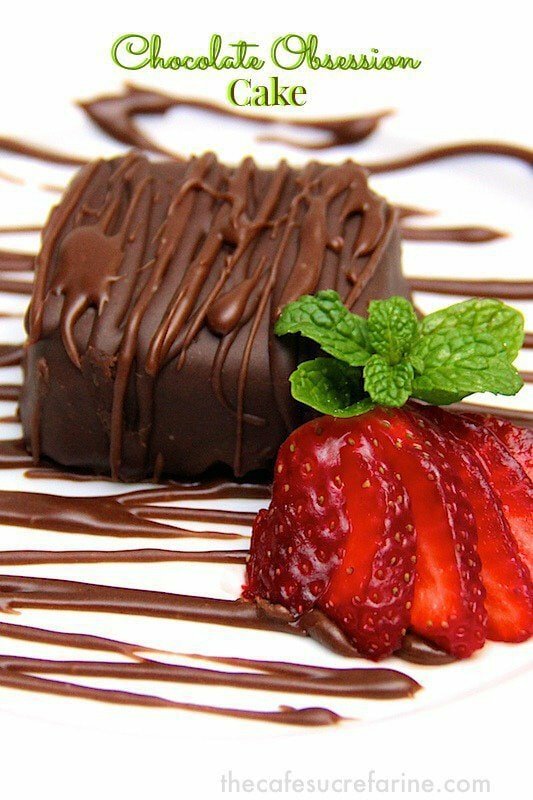 If frosting gets too thick to drizzle at any point, return to microwave for 20-30 seconds, then whisk well until smooth. 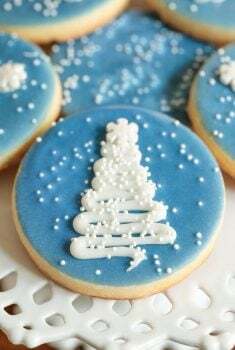 For individual cakes, allow cakes to cool for 10 minutes then invert onto cooling racks placed on top of large sheets of foil; proceed to frost as directed above - using about 1½-2 tablespoons of frosting per cupcake and drizzling second layer as directed. Dutch processed or regular cocoa? Thank you! How do you get the round cake off of the wire rack and onto a serving plate once it’s ftosted? I used a spatula to lift it off and pushed it onto the plate but it collapsed the underside of the cake on one side. Fortunately my family didn’t care what it looks like because it was absolutely amazing! How do you do remove it safely? wHAT IS THE EQUIVALENT IN POUNDS AND OUNCES OR GRAMMES TO A “CUP” IN YOUR RECIPE. YOUR CAKE LOOKS AND SOUNDS DELICIOUS. I WOULD LIKE TO TRY IT. BUT THE “CUP” MEASUREMENTS HAVE STOPPED ME . This is AMAZING! Yummmmm butter in cake sounds so sinfully good!